Mladen Stilinović (1947, Belgrade) from Serbia one of the most significant representatives of Central European neo-avant-garde art. Throughout his diversified work, Stilinović explores ideological signs and their social aspects. 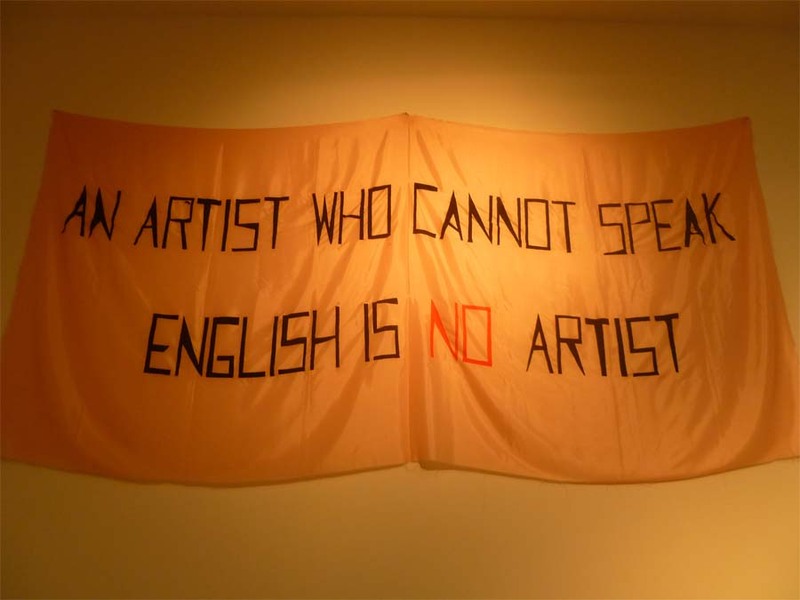 The role of an artist is in the focus of several other works, such as the caption that has become one of his signature works, stating that: AN ARTIST WHO CANNOT SPEAK ENGLISH IS NO ARTIST (1992). Interestingly, the Museum of Contemporary Art in Zagreb lists that Stilinović was born in Zagreb, not Belgrade, and that this now signature work was created in 1992, not 1993. Aside from these differences, it is interesting to note that a colleague told me Stilinović doesn’t speak much English himself, but his wife does, and that her ability to speak English was crucial to his wider success as an artist. All of this brought to the forefront of my mind something I have been cogitating on for a few weeks now: the language an artist chooses to use when there is text in his or her work. Hungarian artists choose, more and more as you might imagine, to use English as the current lingua franca rather than Hungarian. If one were to do a bar graph charting the use of English in artworks, one could imagine that the bar would creep up, and then surge up post-1990, when Hungary shook off Soviet influence and opened up to the West. Of course, English allows artists to communicate outside of Hungary and the art market is global, so choosing to use English can increase one’s success outside of national borders, especially when no other country shares your language. Written language in the visual arts has been a defining development in 20th century visual art. It is used as a direct and immediate (i.e. authentic) means of artistic expression as well as an effective socio-political artistic mechanism (i.e. calculated). Reaching a larger audience often means reaching a wider market. What does this suggest about consumer forces influencing art? 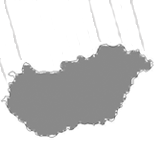 And, what does this mean for authenticity? Does it make an artwork better, or worse, or is it a neutral factor? In the case of work like Stilinović, using English is critical to the piece as a whole, and in the case of activistic works intended to be read by a non-local as well as local community the use of English makes perfect sense. But what about a work like Zsuzsi Csiszer’s installation at the Kunsthalle’s Mi a Magyar exhibition? 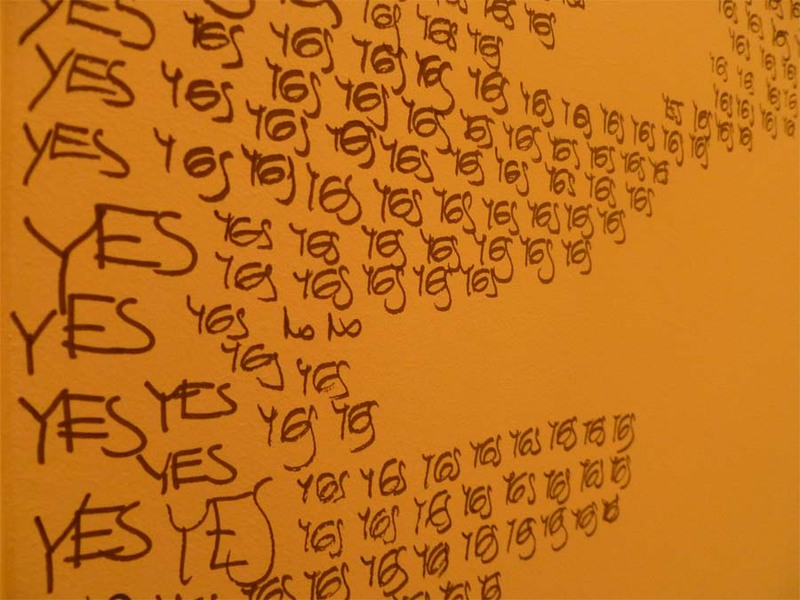 What does it mean when a young Hungarian artist write personal reflections about emotional turmoil in this obsessive manner as “yes” and “no” rather than “igen” and “nem”? One would assume that her unmediated immediate reaction would be to write in her native language. In a work like this, which seems to come from such an “authentic” place, does this calculation to appeal to wider audience make the artwork worse? Or if more successful, then does it make it better, with the rationale that some amount of performative accommodation to one’s ideal audience is always necessary? This entry was posted on October 30, 2012 by linnea8 in Other and tagged An Artist who Cannot Speak English is no Artist, artwork, authenticity, calculation, English language, Hungarian language, language, Mladen Stilinovic, text, written language in art, yes/no project, Zsuzsi Csiszer.